Mining is a major driving force behind the South African economy and the country’s development. South Africa ranks as one of the world’s largest producers of chrome, manganese, platinum and vanadium, as well as vermiculite, ilmenite, palladium and rutile, along with zirconium and coal [1,2]. The country’s coal mines are located in five provinces (Free State, Eastern Cape, Kwa Zulu-Natal, Limpopo and Mpumalanga), with 19 official coal fields. Mining activities generate huge quantities of wastes laden with both harmful and hazardous heavy metals (HMs), as well as some noble metals. These HMs (elements having atomic density greater than 6 gcm-1): Ag, As, Cd, Pb, Hg, Zn, Cu, Ni, Co, Cr, Fe, I, Mn, Mo, Se and Zn, are gradually released into the environment, polluting the ecosystem. The metabolic and physiological processes of plants, humans and even microorganisms are positively influenced by HMs such as Zn, Cu, Ni, Co, Cr Fe, I, Mn, Mo, Se and Zn, commonly known as micronutrients  or essential elements. In contrast, HMs such as Ag, As, Cd, Hg and Pb are not biologically important to living organisms and are usually very toxic to human health and biota in the environment [4,5]. Studies have shown that Al, As, Ba, Bi, Br, Cd, Ge, Au, Pb, Li, Hg, Rb, Ag, Sr, Ti and Zr are present in both plant and animal tissues in micro-quantities [3,6]. The presence of harmful HMs in the environment, particularly above their threshold levels, leads to environmental pollution and ultimately causes serious health problems for humans and animals [7-9]. Mining operations are the major culprits in contaminating the environment with toxic HMs, from almost all stages of their activities, including land excavation, drilling, quarrying and conveying of raw materials, along with milling and grinding and concentrating of ores to disposal of tailings. All of these operations contribute significantly to contaminating the environment . Moreover, trace and radio-active elements also enter the environment through runoffs from cleaning operations, stock storage operations, landfills and bottom and flash ash, as well as scrubber sludge deposited in settling ponds and leachate infiltration into ground water . HMs in concentrations higher than the threshold level  can have negative effects on both plants and animals, including aquatic life. Records have shown that these HMs are capable of imposing a long-term burden on biogeochemical cycling in the ecosystem [13,14]. The toxicity of the pollutant HMs disproportionately amasses or depletes the nutritive essential elements in the host plants, causing damage to the plant and diverse plant diseases . Some toxic HMs such as Cadmium, when present in even trace amounts, is harmful to persons exposed to it . Diverse opinions on the issues of South African mines’ emissions, contamination and remediation have been summarized: environmental effects of heavy metal pollution from gold mines and bacterial remediation strategies ; contaminants and nutrients in sediments ; remedial processes of HMs in waste water treatment systems ; and diverse opinions on the health impacts of the mines’ residue deposits in the Gauteng Province of South Africa, with suggested ways to minimize the associated health problems . This paper, however, summarizes literature on South African mines’ effluent; the harmful HMs leached into the environment and their potential impact on plants, animals and humans in the mine communities and surroundings. The main sources of environmental pollutant metals are broadly classified into two: man-made sources (i.e., industrial, vehicular and domestic) and natural sources (i.e., volcanic eruptions, forest fires, etc.) [18-20]. Owing to the focus of this review, the discussion revolves around HM emissions from mining industry activities, which have escalated in the second half of the 20th century, due to the growing, worldwide need and demand for metal and coal products. Consequently, the emission of toxic metals and other hazardous effluents have increased in alarming proportions and accordingly, amplified the risks of environmental pollution. A highly relevant example is the incident of a large quantity of cyanide that escaped into the water bodies during gold mining and processing in the Ore district of Baia Mare, Romania, in 2000, which led to an immense spread of chemicals and subsequent, severe levels of toxic metals in the environment. The enormous ecological destruction and catastrophe resulting from this activity had an impact comparable to the Chernobyl nuclear disaster in 1986 . Sulfide mining waste is also known to have serious environmental implications due to metal sulfides in mining wastes characteristically oxidizing, in the presence of water, to produce acidic leachates that are laden with HMs. Though sulfide ore bodies remain practically unchanged in the bedrock for very long periods of time, the substantial amount of sulfur that occurs with gold ores forms concentrated sulfuric acid when in contact with water, resulting in Acid Mine Drainage (AMD). A noted environmental concern is that the rate of mobilization of HMs, such as Cu, Pb, Zn and Cr from mining operations, are estimated to exceed, by a factor of ten, their rate of mobilization from natural cycling . Air: Atmospheric HM pollution is as a result of wind action transporting materials from pollution sources, such as mines activities and mine tailings, into the atmosphere. The air particulate matters, in the fine particles region (<2 μm), are usually higher during the winter period. A predominant part of HMs is concentrated in a fine fraction of aerosols, with a particulate diameter below 1 μm; this is the most dangerous particle size from an epidemiological point of view . A study on airborne cadmium, lead, zinc and copper, reveals that their origin can be attributed to emissions from wind-blown dust, material handling and vehicle traffic . Fugitive dust (unknown dust source) is more difficult to control, in comparison to point sources. The dust clouds the mine environment; thus, causing damage to the vegetation and agriculture [24,25] and subsequently, livestock and humans. Water: The occurrence of pollutant HMs in natural water is affected mainly by both hydro-chemical factors, such as the mineral composition of the rocks and soil characteristics, as well as by anthropogenic activities, amongst others. While it is likely to show both temporal and spatial variation [26,27], the metals have many of the same mechanisms (biological recycling, sediment fluxes, oxidation-reduction cycling and scavenging by particles) that control their distribution in the oceans, which are also important in lakes. Despite the diverse water bodies, the influence of each of these mechanisms can be seen in the harmful elements’ profile. Metals in the environment tend to persist in their localities because they cannot be biologically or chemically degraded, as with organic substances. However, metal ions, can be converted into other compounds or metal species (as physicochemical states) through adsorption (binding onto the plant body), precipitation and complexation processes. Biochemical processes, such as assimilation and biomethylation of pollutant metals, lead to new bond types with, as example, the conversion of Mercury to Methyl Mercury, both being processes that result in the conversion to more toxic metal species. The pollutant metals are transferred from water bodies to the food chain via assimilation and processes of bioaccumulation and biomethylation. A cycle of trace metal migration is established in which the geochemical processes in water occur via interfaces into the atmosphere and into the sediment. Toxic metals are distributed by the atmosphere as solids (dry deposition) and in dissolved form (precipitation) as wet deposition in water bodies [27,28]. Metals are deposited in water bodies by means of inflow in dissolved form or as solids (suspended matter). The cycle is completed by the process of sedimentation at the sediment stage, which returns back to bodies of water via desorption, dissociation, dissolution and redox processes, as a result of mobilization or remobilization. The physical and chemical states of metals in water bodies significantly influence the metal levels in water bodies, the effect on organisms and behaviour, with respect to neighboring compartments, such as evaporation into the atmosphere or precipitation in sediment. Table 1 illustrates the impact mining and mineral processing activities have on the water resources of the Limpopo River basin in South Africa. Table 1. Impact of mining and mineral processing activities on the water resources of the Limpopo River basin . The level of acidity (pH) of the environmental media (air, water and land/plant) is crucial in determining the extent of metal enrichment, ranging from drinking water toxification, to problems concerning the growth and reproduction of aquatic organisms . The single most important variable influencing the behaviour of metals in the environment is that of pH. Metal complexes with sulfates, fluorides, chlorides and phosphates, are most stable and important below pH 7, with metal complexes that have carbonates and hydroxides becoming increasingly more important above pH 6-8. Hydrogen ions compete with metal cation for adsorption sites; hence, the adsorption of metal cations by hydrous ferric oxide (HFeO) is, for example, low in acid system but increases with increasing pH. Contrarily, oxyanions of As, Mo, Se and Cr tend to be desorbed from HFeO with increasing pH because of competition between the oxyanions and OH-ions for sorption sites. Moreover, the solubility of most metal-containing minerals is greatest under acidic conditions, decreasing with increasing pH . Soil: It is noted that metals cannot be degraded ; nonetheless, some metals such as Cr, As, Se and Hg, can be transformed to other oxidation states in the soil, reducing their mobility and toxicity. Metals in the soil solution are subject to mass transfer out of the system by leaching to ground water, plant uptake, or volatilization, a potentially important contamination mechanism for Hg, Se and As. Since Potassium is bound largely to clay minerals, both on the inside and the outside, it is the most loosely adsorbed HM to the outer surfaces, hence readily available to plants. The pH and redox conditions are two factors that influence the mobility of elements in the soil. At pH>7: V, U, Se, As and Cr are capable of forming anions and have a high mobility. The redox potential (Eh) also plays a significant role, such as with Cr being more mobile in basic conditions with increasing redox potential, due to the oxidation of Cr (III) to Cr (VI), as in CrO42. The solubility of elements as a function of pH has also been well investigated, such as the solubility of Zn, Cd and Pb, which increases greatly in the acidic region. Subsequently, the soil pH determines the extent of the distribution rates of HMs and hence, HM transfers into deeper soil layers, with the distribution rates by plants dependent on the soil pH . Clay minerals, oxides and organic matter exert a strong preference for some anions in comparison to other anions, indicating the existence of chemical bonds between the surface and the specific anion. Adsorption of metal cations has been correlated with such soil properties as pH, redox potential, clay and soil organic matter, along with Fe and Mn oxides and Calcium carbonate content. Anion adsorption has further been correlated with Fe and Mn oxide content, pH and redox potential. These various soil factors, as well as the form of metal added to the soil and the solvent introduced along with the metal, affect adsorption processes. Metals exist in the soil solution as either free (uncomplexed) metal ions (e.g., Cd2+, Zn2+, Cr3+), in various soluble complexes with inorganic or organic ligands (e.g., CdSO4, ZnCl+, CdCl3-), or associated with mobile, inorganic and organic colloidal material . Several metals in the environment of concern can, subsequently, exist in soils in more than one oxidation state, such as: Arsenic, As (V) and As (III), selenium, Se (VI) and Se (IV), chromium, Cr (VI) and Cr (III) and mercury, Hg (II) and Hg (I). The oxidation state of these metals determines their relative mobility, bioavailability and toxicity. On the one hand, hexavalent Cr is relatively mobile in soils, being only weakly sorbed by soils, while also being extremely toxic and a known carcinogen. Trivalent Cr, on the other hand, is relatively immobile in soil, being strongly sorbed by soils and readily forming insoluble precipitates and is of low toxicity. Metals may precipitate to form a three-dimensional solid phase in soils. These precipitates may be pure solids (e.g. CdCO3, Pb (OH)2, ZnS2) or mixed solids (e.g., (FexCr1-x) (OH)3, Ba (CrO4, SO4). Mixed solids are formed when various elements co-precipitate. There are several types of co-precipitation, inclusion, adsorption and solid solution formation, distinguished by the type of association between the trace elements and the host mineral. The biochemical and humic substances provide bonding sites (functional groups such as carboxylic, phenolic, alcoholic, enolic-OH and amino groups) for metal sorption, forming water soluble complexes with metals, increasing metal mobility. Binding of metals to organic matter involves a continuum of reactive sites, ranging from weak forces of attraction to formation of strong chemical bonds. Soil organic matter can be the main source of soil cation exchange capacity, contributing >200 meg/100 g of organic matter in surface mineral soils . Metals tend to persist in the environment because they cannot be broken down but can merely be converted into other compounds (metal species) [27,28]. Plant: Generally, the metal elements’ composition of plants reflects the chemical composition of their growth media (i.e. soil, air, water and nutrient solution). Metal accumulation in plants depends not only on environmental availability of elements but also on plant characteristics: species, age, state of health, temperature, moisture availability and substrate characteristics . Toxic HMs entering the ecosystem may lead to geo-accumulation, bioaccumulation and bio-magnification. The trace or HM accumulation in plants can, over time, negatively affect the physiological activities of the plants (e.g. photosynthesis, gaseous exchange and nutrient absorption), which could result in reduction in plant growth, dry matter accumulation and yield . HMs is taken up by plants via adsorption, binding onto the plant body and by absorption, penetrating into the inner matrix of the plant or through both processes concurrently . Even though some trace elements are not toxic to plants and animals in small concentrations , others are, including lead, cadmium and mercury, which are quite toxic at low concentrations . Plants are good environmental quality indicators and respond directly to excessive HMs in the air, soil and water [37,38]. In light of the fact that plants can naturally draw pollutants from their local environment, their chemical composition can indicate the degree of disturbances when assessed against the background values obtained from unpolluted vegetation . The introduction of excessive trace elements to plants can result in their toxicity, as illustrated in Table 2 that leads to change of leaf color, inhibition of seed germination and growth of plants or even the death of the plant . Inhibitory effects of excessive presence of certain trace elements in plants can result in, amongst others, blocking of the uptake of essential elements from the soil, leading to crucial nutritional substance deprivation of plants . Copper 10 to 70 Chlorotic leaves and reduced branching, thickening and dark coloration in the rootlets. Nickel 8 to 147 Chlorosis, stunted root growth. Zinc 95 to 340 Severe leaf scorching, reduced yield and decreased net assimilation rate. Table 2. Toxicity levels of HMs and symptoms in plants . Mine tailings are large piles of crushed rock left over after extracting the metal (s) of interest from the host mineral rock. Left over HMs in the tailings are spread through a combination of wind dispersion and water erosion and their harmful impact is evident in wildlife and humans located at significant distances from the tailings site [42,43]. Mine tailings disposal sites from either inactive or abandoned mine sites are prevalent in arid and semi-arid regions throughout the world, including South Africa, western North America, South America, Spain, India and Australia [44,45]. The global impact of mine tailings disposal sites is enormous. There are approximately 500,000 abandoned hard rock mines in the United States , while Mexico alone is affected by 27.1 million hectares of mining activity [44,47,48]. In 2001, South Africa’s Department of Water Affairs and Forestry reported that gold mine waste generates the largest single source of waste and makes up roughly 47% of all mineral wastes produced in the Republic of South Africa . Unreclaimed mining sites generally remain unvegetated for tens to hundreds of years and as a result, exposed tailings can spread over large land areas via eolian dispersion and water erosion [42,44,46,50]. Literature reveals that the Witwatersrand Basin of South Africa accommodates about 270 unprotected (unlined and not vegetated) tailings dams that, overall, cover about 400 km2 in surface area. Tailing dams are a huge source of extensive dust, as well as soil and water pollution , with further indication that the Witwatersrand Basin’s massive tailing dams are a potential, environmental pollution threat. Investigations into the deposits in the mine areas of the Gauteng province of South Africa , reveal that the deposits are of great health concern; containing enormous amounts of toxic metals, such as U, As, Ra, Ni, Zn, etc., The mines’ wastewaters are shown to be loaded with Radon above the required level of 200 mBq.g1 spread over the environment. The very low pH level of water seeping from mine deposits is due to AMD, or acidic seepage from mines that results in the formation of concentrated sulfuric acid, which is when rocks containing sulfur-bearing minerals, such as Pyrite (FeS2) and Marcasite, come in contact with water (Figure 1). The oxidation of ferrous iron, sulfates and hydrogen ions is becoming a serious global problem, as with the forming of iron precipitates of red, orange, or yellow sediments in the bottom of the host streams. The decanting of AMD contaminated water from defunct mines in the Krugersdorp, Roodepoort, Boksburg and Brakpan, as well as Springs and Nigel mine areas of South Africa, into the regional water bodies, for example, the Vaal, Orange and Olifants Rivers, is a growing societal concern. Existing methods of controlling the problem of AMD include thermodynamic measures, which comprise the elimination of oxygen and the maintenance of reducing conditions and kinetic effects [52,53]. 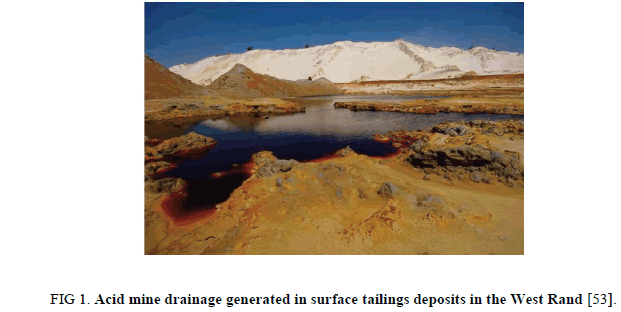 Figure 1: Acid mine drainage generated in surface tailings deposits in the West Rand . Irrespective of the harmful effect of HMs when consumed beyond certain optimal concentrations, HMs can generally pose a serious health risk, even at an undetermined low concentration. Microgram (μg) concentrations of the HMs comprise part of the natural environment of living organisms (human, animal and plant) in the air, water and soil. Heavy metal speciation plays an important role in estimating mobility, biological activities and toxicity. For instance, methyl mercury is more toxic to animals than elemental mercury because it can easily pass through the blood brain barrier causing injury to the cerebellum and cortex. Another example is that of hexavalent chromium (Cr6+), which is much more toxic than trivalent Chromium Cr3+. At low concentrations, some of the elements are nutrients for plants and/or animal life but toxic at high concentrations . Certain metals of the 6th row of the periodic table are potentially the most toxic elements (i.e., Os, Ir, Pt, Au, Hg, Tl and Pb). However, the relatively poor water solubility of the salts of these elements curtails their high toxicity. Nonetheless, Arsenic (As) is a metalloid that occurs in an elemental state, to a small extent and is a cumulative poison that inhibits the thio (SH) group in enzymes. Chronic poisoning with arsenic leads to weight and appetite loss, accompanied by gastrointestinal disorders. Another example is that of cadmium (Cd), which is highly toxic to animals and mostly ingested by living organisms through the air, water and food. Inhalation of cadmium fumes or dust, or from ingestion of heavily contaminated food and water, leads to severe cadmium poisoning. While cadmium accumulates mainly in the soft tissues and more than half the body’s burden of cadmium is found in the kidney and liver , mercury (Hg) binds to the sulfhydryl groups (RSH or thiol) in many proteins in the body, with methylated mercury (Hg) found mainly in the erythrocytes and brain. In addition, mercury poisoning is associated with nausea, vomiting and diarrhea with bleeding, followed by death from gastro-intestinal and/or kidney lesions. Although lead (Pb) is moderately toxic to plants and animals, lead poisoning leads to loss of appetite, weakness, anemia and colic. The excessive intake of Lead can also result in hypertension, renal dysfunction and damage to the peripheral nervous system. Tetraethyl lead is more toxic than either the methylated derivate or inorganic compounds. The general effects of HMs in animals and humans are summarized in Tables 3 and 4, respectively. Cobalt 58 to 69 in liver Reduced feed intake, emaciation, anemia and lack of muscular coordination. Copper >15 in kidney Gastroenteritis, swollen gums, reduced hemoglobin levels, jaundice, metal-colored kidney and splenic enlargement. Iron >2000 in pig’s blood Reduced growth rate and feed intake, anorexia, diarrhea, metabolic acidosis and death. Lead 0.4 in kidney cortex and liver Loss of appetite, weight has depressed stiffness of joints and anemia. Molybdenum Variable Diarrhea, anorexia, depigmentation of hair and wool, neurological disturbance. Selenium 0.3 in hair Atrophy of heart, cirrhosis of liver, cracking of hoof, lameness, loss of hair, stiffness of joints and diarrhea. Zinc Variable Gastrointestinal distress, anorexia, anemia and arthritis. Table 3. Toxicity levels of HMs and their symptoms in livestock and body organs . for 50 yrs. Gastric cramps, vomiting, diarrhea, cough, headache, brown urine, hypertension, malignancy, immune disorder, renal failure. Copper 0.1 to 0.2 mgkg-1 body weight. Wilson’s disease and cirrhosis, haemolysis, hepatic necrosis, renal damage and salivary gland swelling. (>60 mgkg-1 is lethal). Moderate: Vomiting, upper abdominal pain, pallor, diarrhea, drowsiness, severe: Metabolic acidosis and shock (disruption of cellular electron transport). >120 µg 24 h-1 (urine). Pallor, gingival lead line, anemia, multiple neurological symptoms (cognitive). Manganese Variable in different organs. Psychiatric disorder followed by neurological disorder resembling Parkinson’s diseases. Mercury Highly variable for both elemental and organic forms. Gastrointestinal track inflammation (oral, gastric and colonic), abdominal pain, neurological deficit, depression, irritability, confusion, tremor. Central nervous system (CNS) damage: Visual and auditory defects, a taxa and cognitive disturbances. Molybdenum Unknown. Epidemiological evidence of increased blood xanthine oxidase and incidence of gout. Selenium Average of 3180 µgL-1 (blood) Average of 4990 µgd-1 (diet). Hair loss, nail deformities. Zinc Several grams required for acute toxicity. Vomiting, diarrhea, neurological damage (Zn shakes), depression of copper utilization, Fe deficiency, lowered level of HDL cholesterol. Table 4. Heavy metal toxicity in humans: Dosage and symptoms . Mining is a major industrial activity in South Africa, contributing enormously to the growth and development of the country, at the extreme price of huge toxic wastes. The mine areas are not only a health risk but a liability, with a huge number of mines’ residue deposits (dsam tailings) laden with a range of harmful HMs that pollute the ecosystem. These toxic metals are transmitted by various environmental media, causing diseases and the death of humans, animals and plants. George W. Mineral commodity summaries. U.S. Geological Survey. 2013;198. Eberhard A. The future of South African coal: Market, investment and policy challenges. Prog Energy Sust Dev. 2011;1-44. He IZ, Yang EX, Stoffella PJ. Trace elements in agro ecosystems and impacts on the environment. J Trace Elem Med Bio. 2005;19:125-40. Akpor OB, Muchie M. Remediation of heavy metals in drinking water and wastewater treatment systems: Processes and applications. Intl J Phy Sci. 2010;5(12):1807-17. Fashola MO, Ngole-Jeme VP, Babalola OO. Heavy Metal Pollution from Gold Mines: Environmental Effects and Bacterial Strategies for Resistance. Int J Environ Res Pub Health. 2016;1047(13):1-20. Srinivas N, Ramakrishna RS, Suresh KK. Trace metal accumulation in vegetables grown in industrial and semi-urban areas: A case study. J App Eco Environ Res. 2009;7:131-9. Alloway BJ. The origin of trace elements in soils. Blackie Acad. Prof., 2nd ed. London, NY, USA. 1995. Sharma OP, Rajesh Jain KS, Sharma PK. Heavy metals accumulation in soils irrigated by municipal and industrial effluent. J Environ Sci Eng. 2004;46:65-73. Vousta D, Gramanis A, Samara C. Trace elements in vegetables grown in an industrial area in relation to soil and air particulate matter. Environ Poll. 1996;94:325-35. Antwi-Agyei P, Horgan JN, Foli G. Trace element contamination of soils around gold mine tailings dams at Obuasi, Ghana. Afr J Environ Sci Technol. 2009;3:353-9. Van Hook RI. Potential health and environmental effects of trace elements and radionuclides from increased coal utilization. J Environ Mgt. 2009;90:43-53. Brune A, Dietz KJ. A comparative analysis of elements composition of roots and leaves of barley seedlings grown in the presence of toxic cadmium, molybdenum, nickel and zinc concentrations. J Plant Nutr. 1996;18:853-68. Nriagu IO. A silent epidemic of environmental metal poisoning. J Environ Poll. 1988;50:139-61. Nriagu JO. A history of global metal pollution. Sci. 1996;272:223-24. Mortvedt IJ. Heavy metal contaminants in inorganic and organic fertilizers. J Fertilizer Res. 1996;43:55-61. Diamond IL, Mudroch A. Review of techniques for quantifying the transfer of contaminants and nutrients from bottom sediments. Environ Can Nat Water Res Inst. Burlington, Ontario. 1990;106:90-93. Manungufala TE, Sabiti-Kalule M, Aucamp I. Investigation into the slimes dams, mine dumps and landfills (residue deposits) as environmental constraints to low-cost housing projects in Gauteng, South Africa. XXXIII IAHS World Congress on Housing Transforming Housing Environments through Design, Tswelopele Environmental (Pty) Ltd, Randburg, Pretoria, South Africa. 2005. Richardson GM. Natural sources and emissions of elements to the atmosphere. Intl Coun Min Metals. 2002;11. Environ US. Prot Ag. Office of Solid Waste and Emergency Response Publication 9355.4-14FSA. Soil Screening Guidance Fact Sheet. 1996a. US. Environ. Prot. Ag. Washington DC. User’s Guide, Office of Emergency and Remedial Response, Washington, D. C. EPA/540/R-96/018. NTIS PB96-963505. 1996b. Navratil T, Minarik L. Trace elements and Contaminants, In: Cilek V, Smith RH, editors. Encyclopedia of Life Support Systems. 2005;4:1184-213. Flowers I, Bem H, Gobrecka H. Trace metal concentration in size-fractioned urban air particulate matter in Lòd?, Poland. Seasonal and Site Fluctuations. Pol J Environ Studies. 2006;15:759-67. Clyde WS, Stephan JV, Donald FG. Toxic Trace Elements in Urban Air in Illonois. Waste Management and Research Report. 1990. Arpac?o?lu CB. Estimation of Fugitive Dust Impacts of Open-Pit Mines on Local Air Quality-A Case Study: Bellavista Gold Mine, Costa Rica. Paper presented at the 18th International Mining Congress and Exhibition of Turkey-IMCET. 2003. Environment Australia, Diixt Control; Report on Best Practice Environmental Management in Minini. 1998. Jinwal A, Dixit S, Malik S. Some trace elements investigation in groundwater of Bhopal and Sehore Districts in Madhya Pradesh: India. J Appl Sci Environ. 2009;13:47-50. Durand JF. The impact of gold mining on the Witwatersrand on the rivers and karst system of Gauteng and North West province. South Africa J Afr Earth Sci. 2012;68:24-43. Graedel TE, Crutzen PJ. Atmospheric Change, Freeman, New York. 1993. Hooda PS. Trace Elements in Soils. John-Wiley, New York. 2010. Ashton PJ, Love D, Mahachi H, et al. An overview of the impact of mining and mineral processing operations on water resources and water. Contract Report to the Mining, Mineral and Sustainable Development (Southern Africa). Project conducted by the CSIR Environment, Pretoria, South Africa and the Geology Department of the University of Zimbabwe, Harare. Report No. ENV-P-C 2001-042 XVI. 2001. Wuana RA, Okieimen FE. Heavy metals in contaminated soils: A review of sources. Chemistry, risks and best available strategies for remediation. Intl Sch Res Net. ISRN Ecol. 2011. Baker DA. Uptake of cations and their transport within the plants. In: Robb A, Pierpoint WS, editors. Metals and micronutrients: Uptake and utilization by plants. Academic Press, London. 1983;pp:3-19. Suciu L, Cosmos C, Todicia M, et al. Analysis of soil heavy metal pollution and pattern in Central Transylvania. Intl J Mol Sci. 2008;9:434-53. Lokeshwary H, Chandrappa GT. Impact of heavy metal contamination of Bellandur Lake on soil and cultivated vegetation. Cur Sci. 2006;91:622-7. De Vries W, Romkens PFA, Schutze G. Critical soil concentrations of cadmium, lead and mercury in view of health effect on humans and animals. Rev Environ Contam Tox. 2007;191:1-30. Galas-Gorcher H. Dietary intake of pesticide residues: Cadmium, mercury and lead. J Food add Contam. 1991;8:79-80. Diaz E, Massol-Deya A. Trace elements composition in forage samples from various anthropogenically impacted areas in Puerto Rico. Car J Sci. 2003;39:215-20. Kabata-Pendias A. Trace elements in soils and plants, 3rd ed. CRC Press, New York. 2000. Massol-Deya A, Perez D, Perez E, et al. Trace elements analysis in forage samples from a U.S. Navy bombing rang (Viegues, Puerto Rico). Intl J Environ Res Pub Health. 2005;2:263-6. Abbasi SA, Kunhahamed T, Madhavan K, et al. Environmental management of chromium, copper and zinc with respect to impact on growth and germination of gram (Cicear ariatinium). J Inst Pub Health Eng. India. 1992;12:12-3. Altaf WJ. Effect of motorway traffic emission on roadside wild plant in Saudi Arabia. J Radioanal Nuc Chem. 1997;217:91-4. Castro-Larragoitia J, Kramar U, Puchelt H. 200 years of mining activities at La Paz, San Luis Potosi, Mexico-consequences for environment and geochemical exploration. J Geochem Explor. 1997;58:81-91. Gonzalez RC, Gonzalez-Chavez MCA. Metal accumulation in wild plants surrounding mining wastes: Soil and sediment remediation (SSR). Environ Pollut. 2006;144:84-92. Morris AL, Lawrence ARL, Chilton PJC, et al. Groundwater and its susceptibility to degradation: A global assessment of the problem and options for management. Early Warning and Assessment Report Series, RS. 03-3. Nairobi, Kenya: United Nations Environment Programme. 2003. Munshower FF. Practical handbook of disturbed land revegetation. Boca Ratton, FL: Lewis Publishing. 1994. US Environmental Protection Agency; Abandoned mine lands team. 2004. Engels J, Dixon-Hardy D. Tailings disposal-today's storage of high volumes of wastes from mines, Paper presented at the JKMRC International Student Conference, Australia: Julius Kruttschnitt Mineral Research Centre, Brisbane, Australia. 2004. Schwegler F. Air quality management: A mining perspective. In: Air Pollution XIV, Longhurst JWS, Brebbia C A, editors. WIT Transactions on Ecology and the Environment. WIT Press, Southampton, UK. 2006;86. Oelofse SHH, Hobbs PJ, Rascher J. The pollution and destruction threat of gold mining waste on the Witwatersrand – A West Rand case study. Symposium on Environmental Issues and Waste Management in Energy and Mineral Production, Bangkok. 2007. Tordoff GM, Baker AJM, Willis AJ. Current approaches to the revegetation and reclamation of metalliferous mine wastes. Chemosphere. 2000;41:219-28. AngloGold Ashanti Case studies; Woodlands Project – good progress being made with phytoremediation project. Environment – AngloGold Ashanti Report to Society. 2004. McCarthy TS. The impact of acid mine drainage in South Africa. S Afr J Sci. 2011;107:1-7. Coetzee H. Flooding of the underground mine workings of the Witwatersrand Gold Fields. In: Wolkersdorfer, Brown F, editors. Reliable Mine Water Technology, Golden CO; USA. 2013:937-942. Hunter AA, Johnson MS, Thompson DJ. Ecotoxicology of copper and cadmium in a contaminated grassland ecosystem II Invertebrates. J Appl Ecol. 1987;24:587-99.